The girl in the Welsh national dress appeared in front of me, blocking off the light. I looked up warily. 'Hi.' At close quarters I could see her outfit was only a faint echo of Welsh national dress: a basque, fishnet tights, a shawl and a stovepipe hat sitting at a jaunty angle on a mass of black curls. observations: The scene takes place in a hostess club. The girl the detective is talking to is alluring, but she's the wrong one. This is all familiar hardboiled-detective-story territory, but as the title suggests, this one takes place in small-town Wales and all the stock characters are present but a little skewed. This kind of flippant take on the world of Sam Spade or Philip Marlowe is in itself quite familiar territory by now, but this one is better than most. Raymond Chandler, for example, has a colourful, wisecracking narrative style, but describes a world that is brutal, dangerous and usually at best pretty amoral. Some modern takes on the genre also go heavy on the jokes and the clever metaphors and the wacky supporting cast, but forget to bed them into a serious story. The symptoms of Chandler's style are there but not the real thing. Malcolm Pryce, however, has written a proper story with real peril, that also has room for the fun and humour and characters with daft names like Calamity. And Druids, by the way; something I don't think Raymond Chandler or Dashiell Hammett ever thought of including. There are a further five books about this private detective, Louie Knight, with similar punning titles, such as The Unbearable Lightness Of Being In Aberystwyth. I'm going to level with you: I don't think the ladies in the main photo ever worked at Moulin Goch, Aberystwyth's - apparently, the whole of Wales's - "most notorious nightclub". 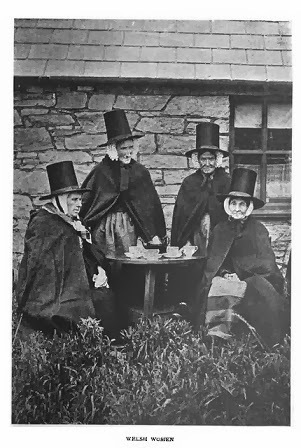 But they maybe understood Welsh traditional costume better than Bianca did. She probably looked a lot more like this pic, which is of Miranda Kerr dressed up to host a Halloween party in NYC. Ha! That did make me laugh... more books to buy methinks! Truth be told I've only read this one - I chose my words carefully - so don't blame me if the others let you down. But I definitely recommend this one. As "The Aberystwyth News Daily" has featured the blog now, I'm looking for books about the Bahamas to cover next, in case someone over there will offer Clothes In Books and me a free holiday. Moira - Thanks for hosting Colm. Colm - Oh, this does sound like a good read. I like the Welsh flavour and the wit. And those 'photos are great. I read this a few years ago, and didn't quite enjoy it as much as I'd hoped to. Something that I can't put my finger on now grated.........which is a shame because I have the following 3! Maybe I need to give him a second go. Like I said above I can't actually vouch for the further books. But I did enjoy the first one. Haven't heard of this author at all, but am definitely interested in trying one of the books. This one, I am sure, since I like to start at the beginning. And I love the covers. I am not sure about mixing humor or Druids with noir but still, I have to try it. So thanks for the introduction. The choice of photos is great too, and so different. He creates a very convincing milieu so anything goes once that's achieved, really. Once a book's set Abroad I'll accept just about anything and he certainly makes Wales feel like an exotic foreign land. Can heartily recommend ALL the books. Your review is spot on re a proper story that races you along. There's a quirky humour coupled with a warmth that I haven't come across anywhere else. I can assure you they are consistently good. As you said they are not just using a storyline to crack jokes; the plot races you along and there is a wonderful mixture of warmth and truly quirky humour that I haven't come across anywhere else - Terry Pratchett has the warmth and Jasper Fforde certainly has a quirky humour but Malcolm Pryce is an original. Thank you very much, Jim. I spoke recently to someone who lives not far from Aberystwyth. She a) loves these books, and b) pointed out that there are some marked similarities between the Malcolm Pryce books and the recent tv series Hinterland / Y Gwyll, also set in Aberystwyth. Although, I'd have to say there was a tremendous shortage of jokes and all round fun and games in the latter.